Dominique de Villepin speaking on TF1, Monday evening. France has been suffering for 12 days from suburban riots that appear to be spreading throughout the country. After being limited to specific areas around Paris for the first few days, the violence began to spread last Friday, Nov. 4. The evening of Nov. 5 was particularly violent, with more than 1,300 cars being burnt. Schools, state buildings and buses were also burnt in the suburban areas of big and smaller cities. The French woke up Nov. 6 with a very bad headache after seeing the destruction and hearing that people were hurt or killed (two people died, killed by youths). They felt frustrated and exhausted. But the night of Nov. 6/7 appeared to be worse: 300 youths confronted police with shotguns, firemen were attacked, 1,400 cars burnt, schools, city halls and churches were damaged or destroyed. Almost 400 people were arrested. Until now, the government has not been able to control events, so Prime Minister Dominique de Villepin decided to appear on TV Monday night. Dominique de Villepin is a former diplomat, who was never elected and has always moved in the background of the political scene until 2003 when Jacques Chirac selected him for the foreign affairs ministry. He became famous for his speech at the U.N., contesting the right of the Americans to go to war in Iraq. A few months later, he replaced Nicolas Sarkozy at the interior ministry and less than one year later, Jacques Chirac named him prime minister, immediately following the "no" vote in the EU constitutional referendum. After saying that the violence was inexcusable, that the state will be firm and fair, he summarized the violence that has confronted the country. Criminal groups are playing a certain role, but the riots are mostly being caused by a small group of determined youths. A snowball effect has spread the violence across the country. He first confirmed that the families of the two boys electrocuted in a power transformer were being updated about the status of current investigations. He then explained that a grenade that exploded in front of a mosque had not been thrown on purpose and that there was also an investigation underway. He continued to explain that 8,000 police and gendarmes were in the field, in addition to 1,500 reservists (not from the army, from the gendarmerie). He thanked the police and firemen for their steadfastness and courage. Since the beginning of the riots, more than 4,700 cars and buses have been damaged, 77 police and 31 firemen have been wounded and 1,220 people have been arrested. One hundred are already in prison, the others are going to court in the coming days. He announced that the government would allow curfews in certain places of the country and that a 1955 law, made to pacify Algeria when it was part of France, is going to be reactivated tomorrow. For now, the use of the army to restore order is not being considered. He encouraged people to organize themselves into neighborhood groups and pacify their neighbors with a "spirit of responsibility." After insisting that "French people can count on us," he tried to avoid speaking about the internal dissensions of the French government. However, he was unable to resist the pleasure of saying, "everyone his own mission, everyone his own job, everyone his own responsibility" -- a polite, but cynical way to show that he's the boss, and that Nicolas Sarkozy, the interior minister, was not really able to handle events. When considering de Villepin's propositions, a few points need to be made: integration worked for the Italians and the Polish between the two World Wars; it worked for the Spanish and Portuguese. But North and West Africans have lived in France for three generations and are still rejected. They can't find jobs; they are not provided with educational assistance and are isolated in places that resemble ghettos. So, what can be done? Two measures are going to be taken: firstly, give more powers to mayors; emphasize dialogue between different people affected by the problems such as the police, government officials, youths, parents, teachers, etc. Secondly, give more money to associations working in these areas that help old people, provide extra educational support, host sports clubs, cultural associations, etc. Outside of that, and for deeper solutions and perspectives, de Villepin evoked the two biggest problems: education and unemployment. In the name of the French government, he made several promises: to help the 150,000 people who finish each year without any qualifications from the education system. The best students will get easier access to universities and will be helped more by older students. For unemployment, while its rate has reached 40 percent in some areas, he said that all young people unemployed in certain areas will be aided by the ANPE (the French public unemployment organization) to find a job or an internship within three months. Finally, he promised to fight against all sorts of discrimination anyway possible. 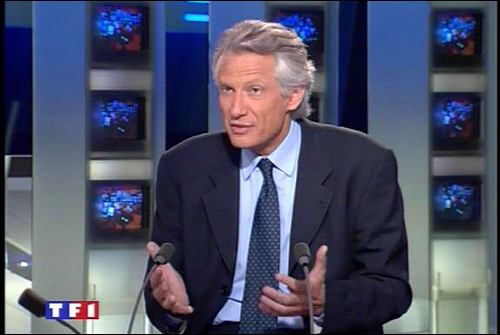 De Villepin was interviewed at 8 p.m. Monday, on TV News, the most watched station on France's TF1. The company that owns TF1 is Bouygues, one of the biggest construction companies in the world. This explains the relationship of the government and the channel, and the respectful tone of the interviewer. When Will France Cool Down? The prime minister is an engaging and charming speaker and he did well. He's a diplomat, educated in the service of the state, raised to respect the republican order and used to the art of rhetoric. When you look at this man, with his salt and pepper hair and a sincere look that makes you want to understand -- or believe? -- he seems conscious of his responsibilities, and of France's virtues. He speaks about solidarity, responsibility, unity, strength, and hope. He's reassuring, never pessimistic, and always looking to the future. But he says nothing. Like soap bubbles, the beautiful words make you dream. You follow him, you believe him, but ten minutes later you find yourself asking -- what does he really think? A few questions arise from his speech. Will the prime minister be able to maintain real cohesion in his team? What immediate effect will his speech have on the violence? Is the curfew going to be the solution to calm down the suburbs? The intervention of the prime minister could be worthwhile if the curfews are effective and the violence stops afterwards. But tonight, as I write, more than 400 cars have already been burnt all across France. The police say the rate of violence has dropped around Paris, but is continuing in the rest of the country. Journalists were attacked in Clichy-sous-Bois, state buildings and a hospital have been damaged. The people who destroy, burn, wound, and sometimes kill will need more than words to change. They are far from words, lost in a world of violence. It will take an enormous effort to integrate them. Are we ready for that? It seems uncertain, since there are so many other problems: social security, union conflicts, etc. People are keeping their thoughts much more to themselves these days. The common feeling in France is deteriorating. That's the biggest challenge for a prime minister: give people the will and the tools to be optimistic and make things change. He has two more years...let's see.